A typical hunting day begins with a wake-up at 4:30 a.m. Breakfast at 5. 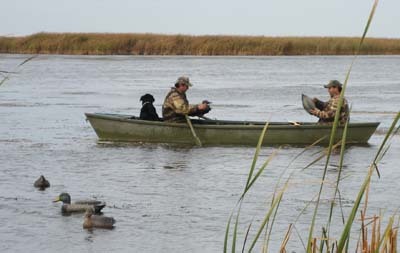 Hunting partners are assigned to a guide who will pick you up at 5:30 a.m. You will go by truck and ATV to the marsh. Transportation in the marsh is by hand-made heavy wooden “marsh boats�? which accommodate two hunters and the guide. 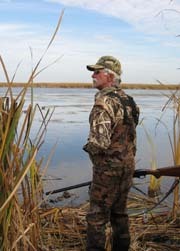 You guide will bring your lunches and do all the heavy work of rowing (no motors allowed in the marsh) setting decoys and retrieving the game. Our guides are all local Canadian licensed guides. They know by the weather, wind and feeding habits of a particular species, where the shooting is to be found. They’ll also fill you ear with the legends of the Delta Marsh, of this historic camp and of the hunters who have preceded you here. There are two hunts per week – three days of hunting per hunt. The lodge can accommodate up to 16 hunters per hunt, but we try to limit to 12. 4 p.m Arrivals, 2 p.m. departure. The season will commence on the 24th of September, and weather permitting, the lodge will be open until the first week of November.